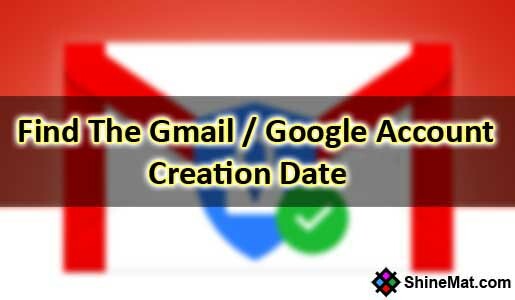 Home > Website > How To Find The Gmail / Google Account Creation Date? This is a common question asked by many peoples who are unable to get access into their Gmail account. This question asked by Google when you want to recover your Google account password. If you are no longer able to access your mobile phone or alternate email address then Google will ask you this question to recover your Gmail account. Your last changed password that you used. Your last sign in activity date or time. Your Google account creation date. So, if you are able to answer these questions perfectly Google will be sure that you are the real owner of the account and they will allow you to recover your Gmail / Google account. READ ALSO: How To Set Google Plus Custom Username? Now the main problem is, we never store or memorize our Google account creation date and when it comes to recover stage we say Oh Crap! What is my Gmail account creation date? So, it is quite important to store our Google account creation date in a safe place because it will helps us to recover our Google account if something goes wrong or even hacked. If you try to search for how to find gmail account creation date without login then you will not get any perfect answer. Note that you have to store the Google / Gmail account creation date when you are able to access your account. And you can’t find out when someone's gmail account was created. There Are Two Ways To Find Out Google Account Creation Date. All Gmail account holders receive a “Welcome to Gmail” email from Google company just after created the email ID. The Welcome email date is the actual date of creation of your Google account creation date. Now, note this date in a safe place. This option is for those peoples who deleted their “Welcome email from Gmail” and only works for the accounts that created after the year 2007. 3. Select “Forwarding and POP/IMAP” tab. The mm/dd/yy is your Google account creation date. Now, save it in a safe place. Again, we never consider this date to store in safe place. Trust me you will feel its actual value when your account are non accessible. So, think now, not after. ● If you want to know when others gmail account was created then you will never get the date. ● There are no gmail account creation date finder or hacking tricks. ● Try to find gmail account creation date without password? Huh! Stay out of this. You are wasting your time buddy. That's why I am suggesting you to memorize your Google / Gmail account creation date before its too late to lost your all Google services like YouTube, Blogger, Adsense, Drive, Calendar and what not. That's all for today. If you have any question regarding this issue simply knock me at comment form below. Stay well and stay healthy. Allah Hafez. 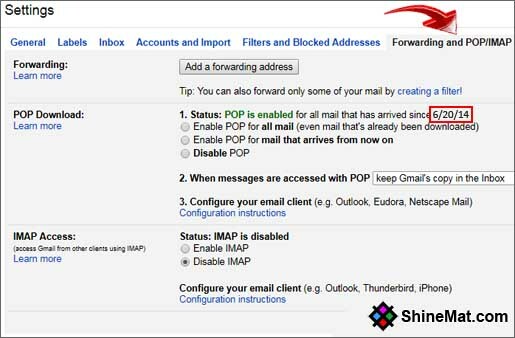 Hello SAMUELA, there are not any problem in "Forwarding and POP/IMAP" tab. It still showing creation date. I just checked it now. Please consider to see again. it doesnt show the that. Did you created your gmail account before the year 2007? If so, then it will NOT show the creation date. I have mentioned it in my post. Simply read the details shown at point no 02. To capture screenshot press "PRINT SCREEN SYS" button from your keyboard and open your PAINT program and press CTRL+V. Finally Save your screenshot and upload to "https://imgbb.com" and send me the viewer link. But you've not told me, did you made your gmail account before the year 2007? I want to know my creation date .. and i delete all the emails . now what should i do . and no pop is enable . If you can help then tell me . Hello Unknown, Please check, there must be a POP / IMAP Settings. Vishal Kale, These methods are truly workable because I personally tested them in my own gmail accounts. Also, whilee writing this comment I have checked that the second option is still working in my account and shows the date. If second option does not work for you, try the first one. Hope this helps. NOTE: Don't publish here your email and password. Helping post for getting real information about google account. Hi, I created my gmail account so long ago I am not certain if it was before or during 2007. Followed your instructions and it says : "POP is enabled for all mail that has arrived since 29/04/2007"
Now would this be the true date of account setup or the earliest available recorded date for POP? Yes! This is the creation date of your Gmail account. Thanks for your comment. I am sorry. In this stage I cant help you. As far I know, there are no way to recover Gmail ID from log info. Consider to open a new Gmail and keep your all security information safe place. Thanks.